Carrier adding new NCR TouchPort™ check-in kiosks at domestic hub airports. Duluth, Ga., June 4, 2013 – China Southern Airlines (“China Southern”) is making everyday easier for its passengers at key domestic hub airports with the addition of a complete self-service airport check-in solution from NCR Corporation (NYSE:NCR). NCR TouchPort kiosks have been deployed at 10 key domestic hub airports in Haikou, Dalian, Wuhan, Hefei, Chongqing, Urumqi, Guilin, Nanning, Changsha and Zhengzhou. The NCR solution includes the hardware as well as common-use self-service (CUSS) platform software, which allows applications from other SkyTeam Alliance member airlines to also run on the kiosks. NCR will also provide support services to China Southern to ensure maximum availability. NCR has been a technology provider to China Southern since 2009 and has become the Airline’s primary supplier for self-service check-in solutions, which now total about 160 units. The technology solution allows passengers to check-in, access flight information, register for membership, scan and print boarding passes and check mileage status. Expanding self-service check-in has become a key part of China Southern’s strategy to improve service efficiency and quality. This hardware and software enhance the self-service offerings at the Airline’s domestic hub airports, and further improve the passenger experience. “We are honored to strengthen our partnership with China Southern by making travel easier and more convenient for its passengers with innovative technology that streamlines and improves the passenger experience,” said Tyler Craig, NCR Travel Vice President and General Manager. China Southern has more than 1,930 daily flights to 193 destinations in 35 countries and regions across the world. Through close cooperation with its SkyTeam partner airlines, China Southern's global route network spans 1000 destinations to 187 countries and regions and nearly every major world metropolis. By December, 2012, China Southern has kept a safe record of 10.37 million flying hours and carried close to 600 million passengers without incident. The airline's safety commitment has - and continues to be - unwavering both throughout China and globally. On September 28, 2012, China Southern was honored with the Diamond Flight Safety Award by the Civil Aviation Administration of China (CAAC), becoming the leading Chinese carrier to maintain the highest safety records in China. NCR Corporation (NYSE: NCR) is the global leader in consumer transaction technologies, turning everyday interactions with businesses into exceptional experiences. 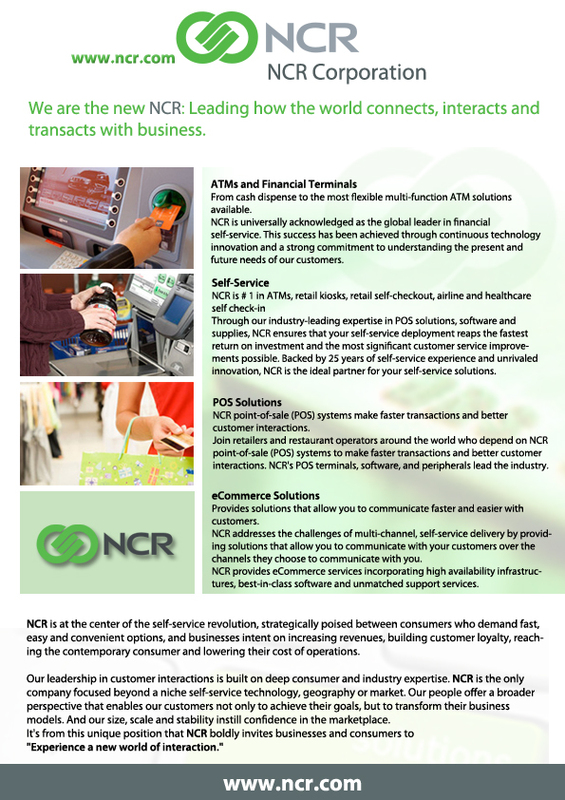 With its software, hardware, and portfolio of services, NCR enables more than 300 million transactions daily across the retail, financial, travel, hospitality, telecom and technology industries. NCR solutions run the everyday transactions that make your life easier. NCR Corporation (NYSE: NCR) serves as a one-stop shop for cinemas looking for solutions designed to make life easier for movie patrons. Las Vegas, April 15, 2013 – NCR Corporation (NYSE: NCR) serves as a one-stop shop for cinemas looking for solutions designed to make life easier for movie patrons. The wide variety of NCR’s cinema solutions available for all sizes of cinema operations, including independent theatre operators, will be on display this week at booth 2603A at CinemaCon April 15-18 at Caesars Palace in Las Vegas. "As a leading provider of consumer transaction technologies that define cinema today, we give attendees the ability to see these systems in action as if they were at their own site," said Brian Whitney, managing director, cinema, NCR Hospitality. "We also want attendees to know that integration comes not just from acquiring the right solutions, but from having the knowledge and expertise to make them work together. CinemaCon, which will attract tens of thousands of visitors over five days, provides the ideal opportunity for us to show attendees how this can work in their locations." Movie Time 2.0, a new smartphone application which makes it easy for patrons to browse schedules, buy tickets and concessions, check loyalty profiles and more. NCR Movie Time can be designed specifically for individual cinema brands, enabling theatre operators to maximize valuable marketing opportunities with consumers and to build loyalty. Slimline 85 Kiosk for cinema, a new automated ticketing kiosk that makes it easier for moviegoers to purchase tickets and concessions with a tablet-like user experience. The kiosk has a 32-inch touch-screen which can display multi-media of movie art and trailers providing an engaging way to buy tickets and pay for concessions. NCR Customer Voice and the NCR Aloha Loyalty suites which enable cinema operators to differentiate and market their brand to key patrons and then measure their guest satisfaction quickly and easily. 12-inch and 15-inch point-of-sale (POS) terminals that deliver more processing power, higher reliability and ease-of-use all integrated into an energy-efficient and award-winning design. For more information on these and other NCR cinema solutions, visit the NCR CinemaCon booth, #2603A, for a tour during show hours. NCR Corporation (NYSE: NCR) is a global technology company leading how the world connects, interacts and transacts with business. NCR’s assisted- and self-service solutions and comprehensive support services address the needs of retail, financial, travel, healthcare, hospitality, gaming and public sector organizations in more than 100 countries. NCR (www.ncr.com) is headquartered in Duluth, Georgia. DULUTH, Georgia – As part of a strategic initiative to strengthen its competitive position in fast growing emerging markets, NCR Corporation (NYSE: NCR) today announced that it will expand solutions and services to retailers in Brazil and, for the first time, plans to recruit a range of new retail channel partners as part of its new sales coverage model throughout the country. Initial retail solutions offered in Brazil will include NCR RealPOS™ assisted-service point-of-sale (POS) terminals, software and peripherals. NCR has already signed up three new NCR Elite channel partners as part of the program: ADD Mark, which will focus on software sales, and Seal and Minas Control, which will each deliver hardware and services throughout Brazil. According to Euromonitor International, Brazil had the second fastest growing retail market in the world in 2010 and contributed more than $33B USD of new consumer spending to the global retail markets. Euromonitor’s data also shows that over the next five years the Brazilian retail market is forecasted to grow an average of nearly six percent per year, making it the third fastest growing retail market in the world just behind China and India. NCR’s retail strategy in Brazil will focus on reaching super and hypermarket chains, department stores, convenience stores, franchises, the food services market and building material and DIY chains. NCR has operated in Brazil for 75 years, localizing solutions for the needs of Brazilian companies and making significant investments in manufacturing, service support infrastructure and R&D. NCR continues to recruit retail industry domain experts and professional services consultants to complement the support it currently provides to multi-national retailers in the country. NCR Corporation (NYSE: NCR) is a global technology company leading how the world connects, interacts and transacts with business. NCR’s assisted- and self-service solutions and comprehensive support services address the needs of retail, financial, travel, healthcare, hospitality, entertainment, gaming and public sector organizations in more than 100 countries. NCR (www.ncr.com) is headquartered in Duluth, Georgia. NCR is a trademark of the NCR Corporation in the United States and in other countries. Introduction of new technology and expansion of channel partnerships will help Brazilian retailers improve customer experience and drive productivity. (NYSE: NCR) today announced that it will expand solutions and services to retailers in Brazil and, for the first time, plans to recruit a range of new retail channel partners as part of its new sales coverage model throughout the country. Initial retail solutions offered in Brazil will include NCR RealPOS(TM) assisted-service point-of-sale (POS) terminals, software and peripherals. NCR has already signed up three new NCR Elite channel partners as part of the program: ADD Mark, which will focus on software sales, and Seal and Minas Control, which will each deliver hardware and services throughout Brazil. According to Euromonitor International, Brazil had the second fastest growing retail market in the world in 2010 and contributed more than $33B USD of new consumer spending to the global retail markets. Euromonitor's data also shows that over the next five years the Brazilian retail market is forecasted to grow an average of nearly six percent per year, making it the third fastest growing retail market in the world just behind China and India. NCR's retail strategy in Brazil will focus on reaching super and hypermarket chains, department stores, convenience stores, franchises, the food services market and building material and DIY chains. "The retail industry continues to fuel a large part of Brazil's robust economic growth," said John Gregg, vice president and general manager for Brazil, Caribbean and Latin America, NCR Corporation. "Both multi-national and domestic retailers are expanding in a fast-paced environment and require new retail technologies to enhance their customers' shopping experience while delivering operational efficiencies. NCR aims to provide innovation through a partnership approach that enables more retailers to compete effectively for the growing consumer base in Brazil." BEIJING, China –NCR Corporation (NYSE: NCR) today announced that it has secured its largest ever ATM services contract in China, as NCR continues to grow both its software and services businesses worldwide as well as its operations in emerging regions. NCR will provide hardware maintenance services for approximately 10,000 units of NCR-branded ATMs installed at the Agricultural Bank of China (“ABC”), helping drive higher ATM availability to improve the bank’s customer satisfaction. The contract also is one of the largest services contract wins in the Chinese banking industry. ABC has the largest ATM network in China. By the end of 2010, ABC had 54,510 cash related self-service banking facilities, which was the top among large commercial banks, with an annual total transaction volume of RMB4.80 trillion. In 2010, ABC installed the new version of self-service terminals for 30 branches, providing nearly 60 types of services, including inquiry, fund transfer, financial management and loans to Huinong Cards holders. The security of self-service terminals and the ability to provide financial service and management support were significantly improved. The signing of the service contract with NCR is one of the initiatives to further improve its ATM network performance. NCR Services has tailored a detailed maintenance service plan for every branch of ABC in different regions according to their specific requirements for their ATM networks. The ultimate goal is to help ABC to achieve 99 percent ATM availability and shorten its ATM downtime response.